Felt seat pads round, made of wool felt 5 mm, look good and feel wonderful. 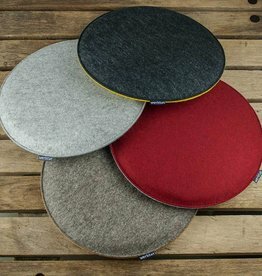 The round seat pads made of pure wool felt absorb moisture, dry quickly and insulate against heat and cold. The felt pads can be used on both sides - indoors, outdoors and on the move - for your chair, bench or stool. On request we provide the chair or bench pads made of 100% virgin wool with an anti-slip coating of natural latex. Beautiful. Soft. Comfortable. Especially when sitting for longer periods of time, the round felt pads can fully exploit their advantages, the more relaxed sitting also protects against premature fatigue. The special colours for felt seat pads create additional visual appeal. On cold days, having a warm seat quickly resembles the feel-good atmosphere of an oven bench. Last but not least, the countless colours of the felt seat cushions make it possible to furnish the interior of your home to suit your personal taste. And what's more, a new colour is good for the soul and a new look also provides variety.